The Korean Education Ministry said Tuesday it would launch its first state-run platform for Korean massive open online courses, dubbed K-MOOC, by the second half of this year. It is proposed to develop 20 pilot lectures within this year and gradually increase the number to 500 by 2018, according to the plan unveiled in Tuesday’s weekly Cabinet meeting. The ministry will also use existing lectures provided by Korea Open Course Ware, an e-learning service that provides video lectures and reference materials for higher education that was launched in 2007. As of December, 9,628 classes are provided by 183 colleges and universities across the country. The government will be in charge of creating the platform, but individual colleges will maintain the respective courses they provide. People who complete the courses can receive certification. A majority of Korea’s top-tier colleges have shown interest in the 2.2 billion won ($2 million) project, according to a ministry official. The government has yet to finalize a plan to actually grant degrees or college credits for K-MOOC lectures. 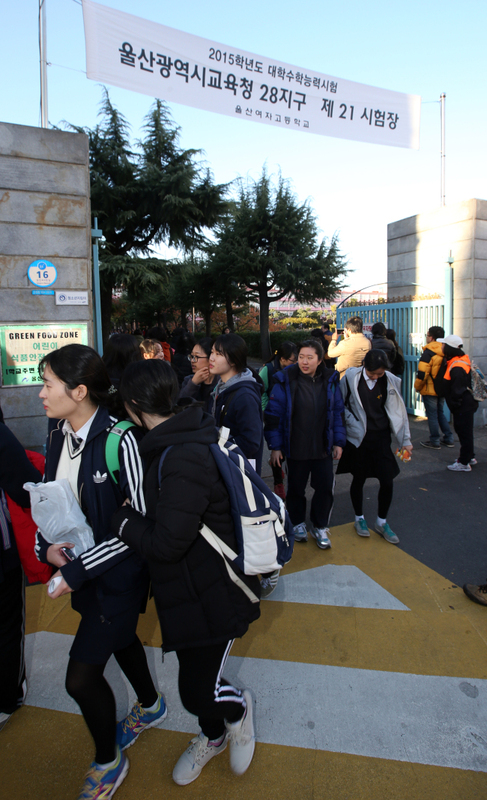 South Korea’s Education Ministry on Wednesday launched a civilian committee to reform the country’s trouble-laden college entrance exam, Suneung, following public criticism over its inconsistent difficulty level and reccurring errors. The move was in response to the public outcry after the Korea Institute for Curriculum and Evaluation (KICE) ― in charge of making the exam questions ― acknowledged that two questions in this year’s annual exam were flawed, marking a second straight year an error was found in the exam. Adding insult to injury, this year’s math and English tests saw a spike in the number of high scorers, intensifying competition among students in the upper bracket. Suneung is now facing doubts from scholars, education experts and even politicians who have called for reform of the 20-year-old system. South Korea plans to conduct a pilot program to use digital textbooks at hundreds of elementary and middle schools around the country during the 2014 school year, the education ministry said Wednesday. Digital social studies and science textbooks are being developed for third- and fourth-year students of elementary schools and first- or second-year middle school students, it said. Some 150 elementary and 300 middle schools around the country have been chosen to use the new type of textbooks in the 2014 school year, the ministry said. Officials expect the e-books will help students more easily understand what they are learning with terminology dictionaries, relevant video clips, test questions and materials for in-depth and compensatory learning in addition to content from existing print-version textbooks. Academics at leading South Korean universities are the world’s best at attracting funding from business, a new study says. 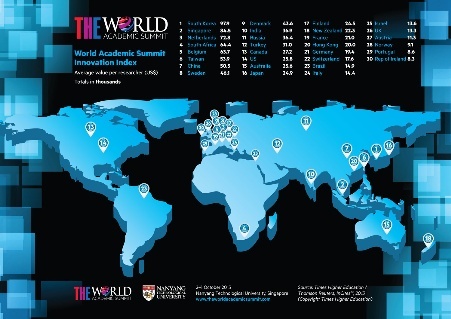 Compiled by Times Higher Education, the World Academic Summit Innovation Index shows companies are investing the equivalent of £62,780 ($97,900) in each scholar in South Korea to carry out work in innovation and research on their behalf. Singapore is in second place, bringing in an average of £54,462 ($84,500) per academic, with the Netherlands in third (£46,921; $72,800). The US lies in 14th position, with industry contributing nearly four times less to its academic researchers (£16,628 or $25,800 per person) than in Korea, according to the index, which is based on data from the world’s top 400 universities as assessed by the THE World University Rankings. The UK is in just 26th place, attracting £8,572 ($13,300) per researcher from industry. For full article, see Times Higher Education. South Korea’s universities specializing in science technology plan to permit students to take a break for up to eight semesters and faculty members up to six years to revitalize business start-ups. The Ministry of Science, ICT and Future Planning has developed a draft guideline on regulations about starting a business, which can be applied to the country’s five science technology universities: Korea Advanced Institute of Science and Technology (KAIST); Gwangju Institute of Science and Technology (GIST); Daegu Gyeongbuk Institute of Science and Technology (DGIST); Ulsan National Institute of Science and Technology (UNIST), and; Pohang University of Science and Technology (POSTECH). The ministry will hold a public hearing and receive feedback from faculty members and students about the guideline at KAIST in Daejeon Wednesday. The draft gives six years of break to professors and eight semesters of leave of absence to students to facilitate their entrepreneurship activities. The GIST and UNIST do not permit students to take leave of absence to set up start-ups, while KAIST, DGIST and POSTECH allow four semesters at maximum. Korean universities have taken three of the top 10 places in a recent ranking of Asia’s best institutions. In the first edition of Asia University Rankings released on Wednesday, Korea had 14 of the top 100 institutions and more in the top 10 than any other country, according to Times Higher Education. Pohang University of Science and Technology ranked fifth on the list, followed by Seoul National University in eighth. Korea Advanced Institute of Science and Technology was ranked 10th. The British weekly magazine published the list by using 13 separate performance indicators, including teaching, research, knowledge transfer and international outlook. South Korea’s market for online or electronic education systems dubbed “e-learning” rose sharply last year due to the rising demand for services on mobile devices, the government said Tuesday. The combined sales of the country’s e-learning service operators came at 2.7 trillion won (US$2.48 billion) last year, compared to 2.45 trillion won tallied a year earlier, according to the data by the Ministry of Trade, Industry & Energy. Of South Koreans aged three and above, 53.3 percent used e-learning services in 2012, up 0.5 percentage point from 52.8 percent tallied the previous year, the data showed. The ministry attributed the growth to the rising number of students with mobile devices, as 30.2 percent of South Koreans aged three and above experienced using e-learning services through portable equipments last year. Many interracial children living here whose mothers are from overseas have problems communicating in Korean at school. The number of such children here aged 6 or below reached 93,537 last year, an increase of more than 40 percent from 2009. Although they have access to textbooks, these are not helping them communicate on every day matters. 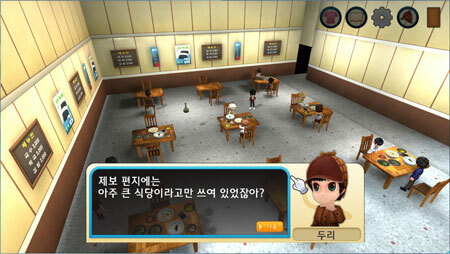 To help them, a newly-developed online game for Korean language has been launched. “Hangeul Detective ― Hana and Duri” was developed by T3 Entertainment, a sister company of Hanbitsoft, a game publishing and development company, in association with Seoul National University’s language institute and the Korea Creative Content Agency (KOCCA). It is a game with a serious purpose, focused on providing a mixture of Korean language education and entertainment. Koreans spent some $4.3 billion on overseas studies last year, about 80 times the amount spent by foreign students here, according to the Bank of Korea (BOK), Sunday. Although the number of Korean students abroad and their spending have decreased slightly, they still number far more than foreign students here and their expenses, causing a huge deficit in the country’s overseas study account. The data from the BOK and Statistics Korea showed that 239,213 Koreans spent $4.36 billion in 2012 on overseas study. The figure was a slight drop from $4.38 billion a year before. Annual overseas study spending hit $5 billion in 2007 and plummeted to $3.9 billion in 2009 in the aftermath of the global financial crisis, but has remained more than $4 billion on average since 2006.